Indo-Greek, Bactria, Heliokles II, 110 to 100 BC. Size : 18.8 x 22.6 mm rectangle. Weight : 8.75 grams. Reference Mitchiner Ancient - 1908 variety. SNG ANS 1151-54 variety. Grade : XF/gVF, black patina. 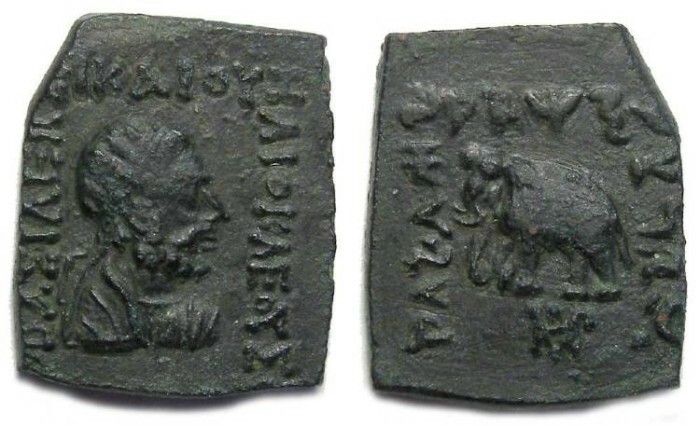 Obverse : Head on an Heliocles right, with a Greek inscription naming him as King. Reverse : Elephant walking left, with a Karosthi inscription around, and a monogram below.